Image above, Little Bean Roasters by More Design Office, photo by Raphael Oliver. Written by Sarah Hetherington. The movement towards clean living and well-being has, according to Sarah Hetherington, amplified the current trend of transporting nature indoors. Whether inspired by Japanese gardens, tropical rainforests or the Australian bush, there has been a proliferation of greened interiors in commercial, residential and hospitality projects. Aesthetically, greenery enhances the overall space, while counterbalancing the increased use of technology, reducing air pollution, creating a balanced and highly oxygenated space, reducing workplace stress, and increasing performance and productivity. And meeting Green Star BCA requirements. “Simple, light and elegant” was the brief given to Mark Simpson, of DesignOffice, when the practice was commissioned to design the new premises for Little Bean Roasters in Shanghai. Having previously undertaken studies in Melbourne, the client wanted to integrate an Australian aesthetic, by “bringing green inside”. Working collaboratively with local architect, More Design Office, DesignOffice stripped back the 1990s industrial building, which was framed by exterior glass walls facing greenery on three sides, while adding a series of circular and curved forms in concrete and timber. Similarly, a greened interior was part of the brief for the retail upgrade of the Brisbane International Airport, designed by Arkhefield in collaboration with Richards & Spence. Using predominantly Queensland-based, non-toxic natives to create an inviting environment for international travellers, the intention was not only to freshen the air-conditioned air quality, but to also create a purpose-built ‘outdoor room’, where children could sit and play, or adults could relax and read. The design interweaves planter boxes, overhead greenery, leafy palms and a central grassed area framed by retail and hospitality spaces. Hamish Guthrie, of Hecker Guthrie, affirms interior “planting is not an afterthought or styling device”, rather “a design concept in its own right, carefully curating the plant selection to complement and enhance each interior identity that not only adds a living freshness to the space… but also helps to extend and blur lines between spaces, be it inside and outside, or creating cohesion across different rooms”. The Ugly Duckling by Hecker Guthrie. Photo by Shannon McGrath. The Ugly Duckling, an intimate, contemporary cocktail and wine bar in Melbourne, highlights this. The site’s architecture “provided an impressive Heritage-listed atrium”, through which light could bathe the soft-hued wooden and white interior. The concept was to “celebrate the heightened space with tall, slender trees to create an intimate canopy above the seating”. “Fragmented reflections of the leaves against the skylight are bounced around the room by mirrors,” says Guthrie. Additionally, the use of plants has acoustic benefits in hospitality environments. Mature ginkgos were planted with Hedera canariensis (ivy) underneath. 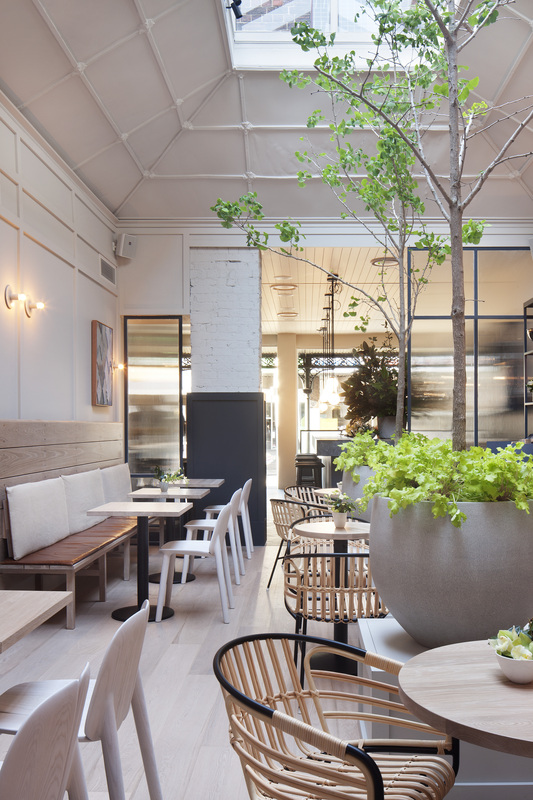 “The foliage is a delicate, translucent green,” contrasting to the ivy, which provides “a shocking, textural vibrancy to the space,” says Guthrie. The result is an inside location where one can enjoy socialising without the concern of sunburn, rain or humidity. 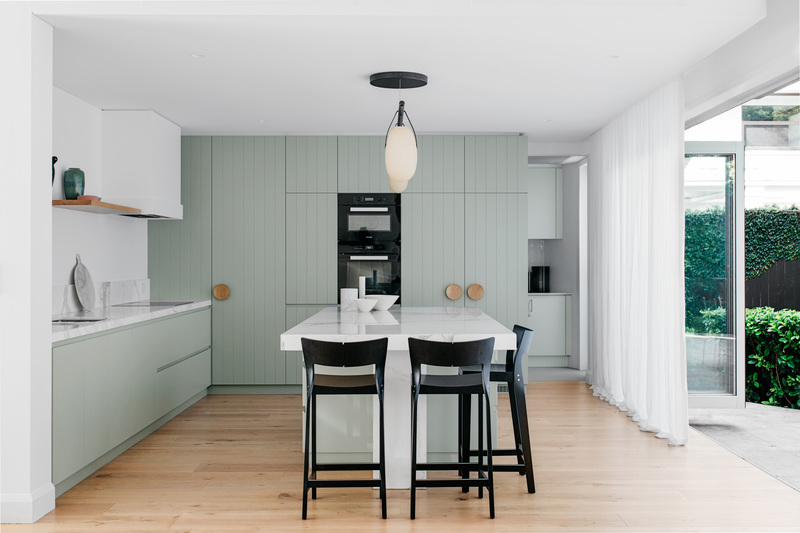 Arent&Pyke Double Bay House. Photo by Felix Forest. Completed in 2015 by HASSELL, AGL Australia’s new Melbourne workplace reflects the brand’s values of sustainability, employee unity and renewable energy. The use of natural materials, a muted colour palette and extensive plantings successfully achieves this. Jacqui Low at HASSELL says, “Planting within the workplace helps relieve stress, improves internal air quality and transforms views from grey to green, creating a healthier working environment… a more human character, more tactile and vibrant, contrasting the external built city.” HASSELL’s approach to using indoor plants is integrated from the project’s commencement, always working closely with its landscape team to develop and design interiors that are “cohesive, creating an internal landscape that complements the interior design”. Renowned landscape designer, Joost Bakker has witnessed a “worldwide movement” towards biophilic design (the human interaction with the natural environment). Bakker is a firm believe in a plant’s ability to reduce office pollution and toxic substances – not only airborne chemicals, but also ones existing in furniture and technology materials. The long-term effect of chemicals on human health is uncertain and so, more than ever, oxygenating air is crucial. Uniquely, Bakker’s approach is not one of styling decorative foliage, but rather enhancing the biodiversity of soil and its maximum surface area in a pot to absorb airborne toxins. Bakker’s vertical garden designs, created in collaboration with Schiavello, offer a contemporary aesthetic, yet are highly adaptable in their functionality. The new grid system features larger pots (with an increased soil surface area) that stack atop tiles, which slot into steel frame shelves. Versatile by nature, a vertical garden can be used as a room divider, bookshelf and storage unit, or as a garden wall. Vertical Garden for plants, designed by Joost Bakker. Image courtesy Schiavello. The newly designed Melbourne studio of Woods Bagot embarked on a consultative strategy with its staff to redesign its workplace, making a dedicated decision to incorporate indoor plants in gathering areas, further building on the success of incorporating nature in other major projects. The studio’s interior features strong timber and steel elements, and the considered use of greenery assists in the softening of the overall aesthetic. 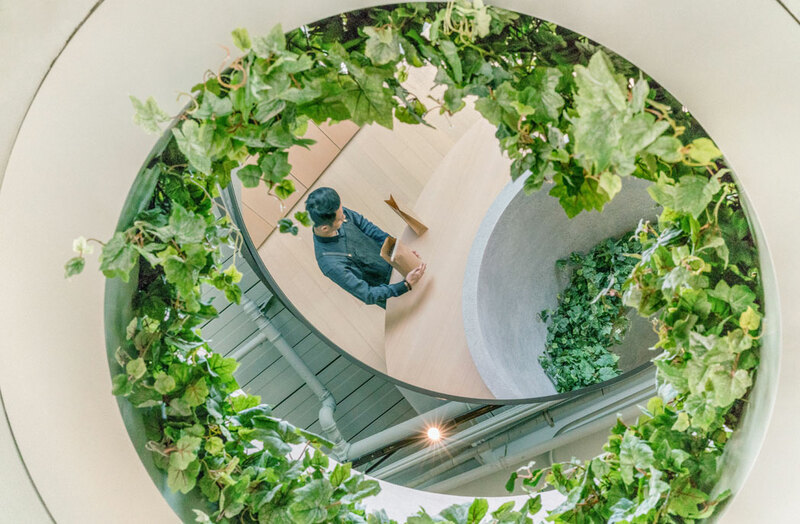 In an attempt to recreate a balcony feeling inside, the plants both oxygenate the space and generate a talking point – socialisation, conversation and collaboration. Sue Fenton, senior associate, highlights the communal experience inherent in the studio – colleagues can “celebrate creative pursuits” and “extend the conversation around central meeting and breakout areas”. While previously ongoing maintenance costs were a deterrent for large corporations, irrigated pots and watering systems have been developed to ensure excellent care, with minimal issues. The University of Sydney recently commissioned Geyer to design the new Student Administration Services inside the existing Jane Foss Russell Building – a brutalist, concrete structure originally designed by John Wardle. Geyer recognised the need to create a positive first impression at the first point of contact. “Signals are important… we wanted to humanise the space and create a warm, welcoming message,” says Simone Oliver, partner at Geyer. Using biophilic planning principles, Geyer created a flow of wooden pod shapes and recycled materials to “soften the experience” and create a “cocoon-like environment”. 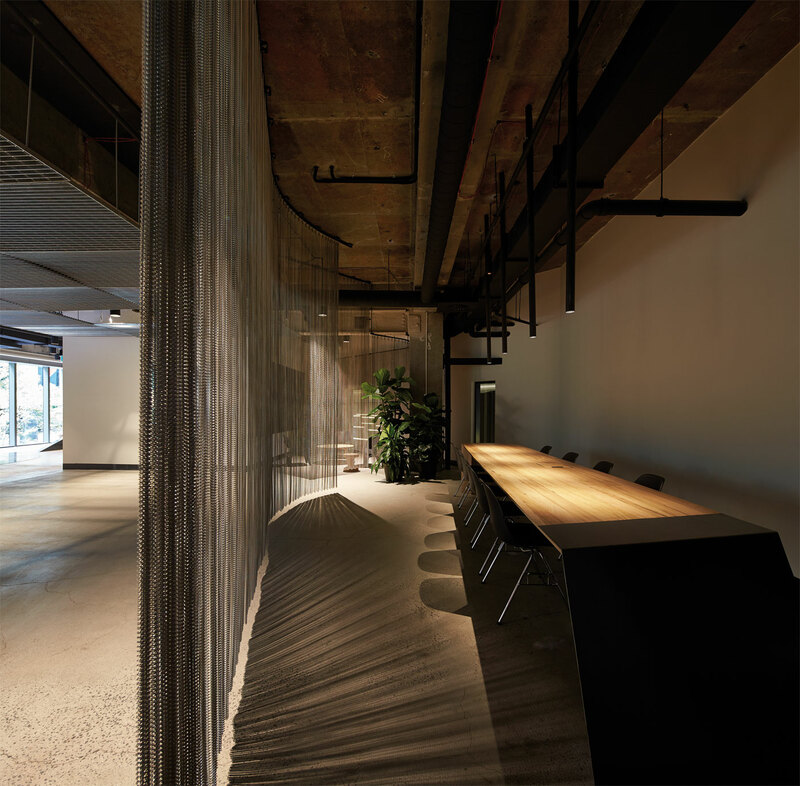 Woods Bagot Melbourne studio. Photo by Peter Clarke. The integration of plants and the construction of the green wall featuring Australian natives is the first of its kind at the Sydney campus and an important, sophisticated feature. Aside from meeting Green Star ratings, many Geyer projects now feature landscape designers as integral consultants. With a multitude of health and wellness benefits greened interiors will continue to evolve. Clients’ desire for being surrounded by nature is increasingly at the forefront of today’s lifestyle choices. Furthermore, advances in display systems, an increasing variety of indoor plant choices and strong biophilic design principles add real purpose. Then there is always the initial, obvious aesthetics of a beautifully potted plant. This article originally appeared in inside 94 – available now on newsstands, or digitally through Zinio.